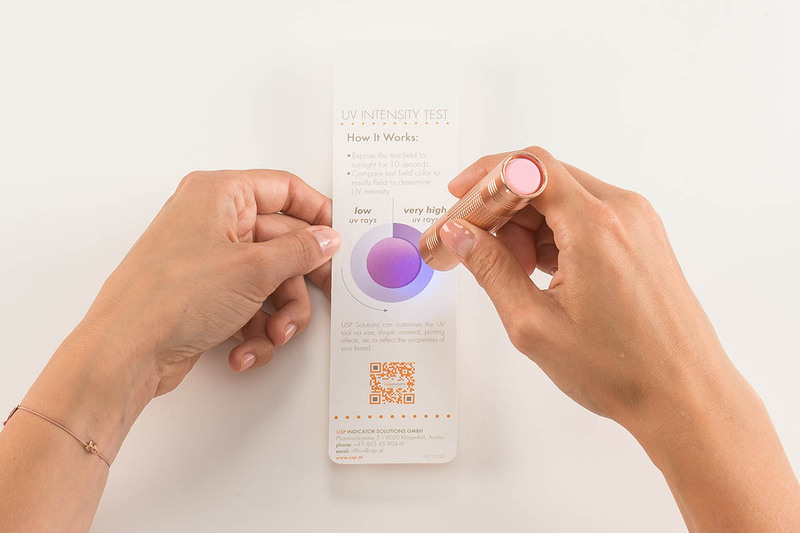 USP Solutions’ UV Intensity Test is a reliable and easy-to-use test which appeals to your consumer’s senses, enabling them to touch and feel your brand, thus emotionally engaging them. 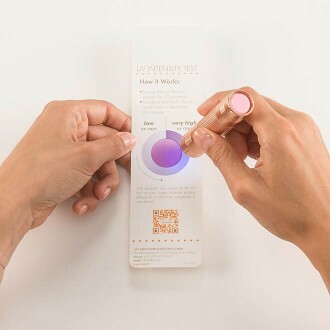 The UV Intensity’s test area reacts with a color change when exposed to UV radiation within seconds. The more extreme the color change, the higher the UV intensity level. 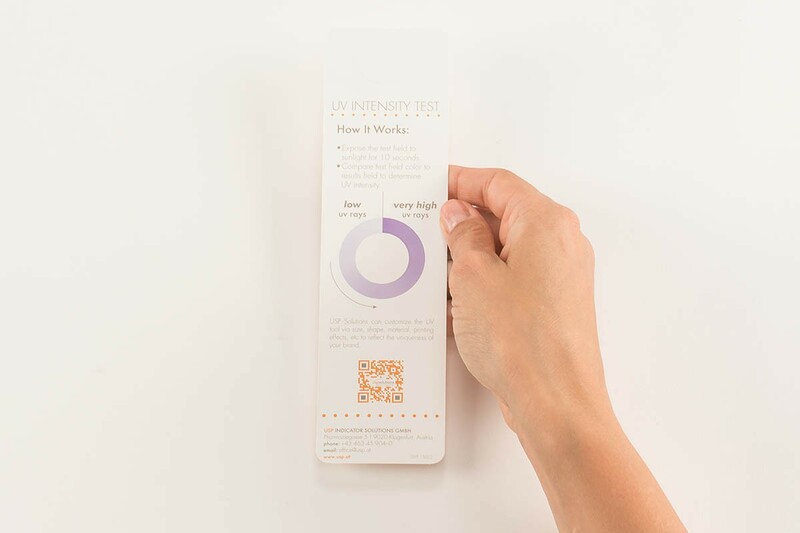 The knowledge about the individual’s sun care needs and UV radiation, combined with product information, guides consumers to purchase their appropriate sun care selections from your brand. Sun care brands offer a wide variety of different UV products with different SPF factors and filters. Which product is suitable for which UV intensity? How do you, as a Marketing Executive, guide consumers to the right product choice within your range and prove your product claim? How do you get attention and raise UV awareness in the first place? Customers are often overwhelmed by the great variety of UV protection products and the different SPF factors. Many consumers are unaware of the need for sun protection and unaware of the damage UV rays can have on our skin. How do they know if the product holds what it promises? Do I need sun protection? Which sun protection is right for my skin? Which SPF factor do I need? How do I know if the claim works? 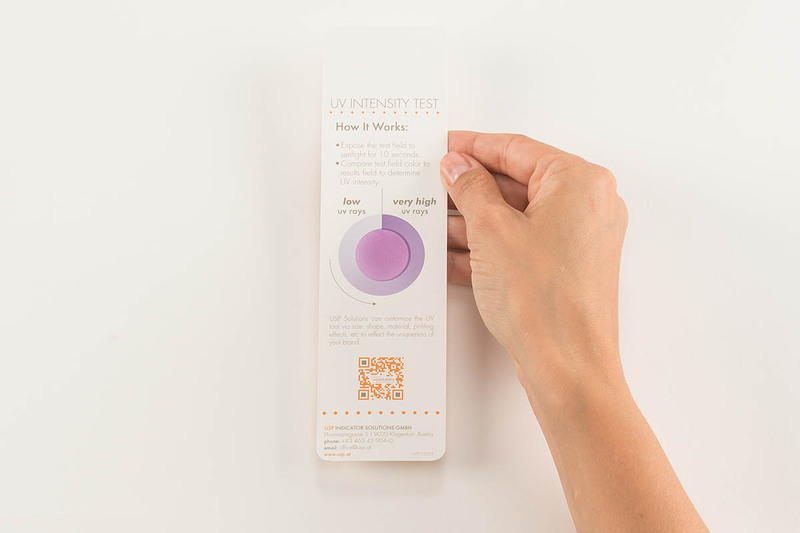 The USP Solutions UV Intensity Test enables your cosmetics brand to design an emotionally engaging and tailor-made “Beauty Moment of Truth”. 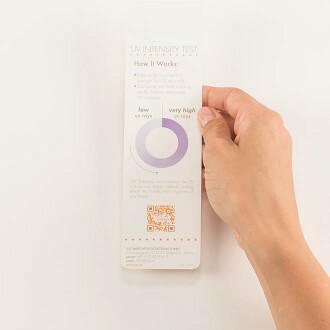 Place the UV bookmark in front of you. Expose test field of UV bookmark to sunlight or a UV lamp for 10 seconds. Depending on UV intensity, the test field will change color from light to dark purple. 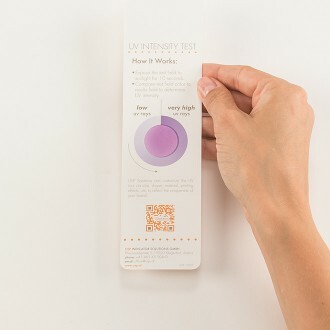 We can easily customize the UV Intensity Test and adjust size, shape, material, printing effects and more – so the tool perfectly reflects the uniqueness of your brand.